Things are suddenly getting very real around here. After months (okay, years) of writing and revising A Strange Companion, it’s suddenly a real book. It’s available for pre-order on the major bookseller sites. A printed proof arrived and I have held it in my hand. I’m throwing a Publication Party, and I couldn’t do that without a real, published book. It’s all been a bit of a whirlwind these past few weeks and I’ve been living or dying by the task list. I’ve eaten meals but, more than once, I’ve looked at my empty plate with no recollection of cutting, chewing, or swallowing food. My husband has asked me questions and I’ve found myself staring at him as if he’s speaking an alien language, while my brain spins to catch up. If someone asked me my plans for the weekend, I’d say, “Oh, nothing special,” but I’d be thinking, Duh. I’m working on my book! I think it’s supposed to be this way. A book launch is supposed to be a crazy time of preparation, of dotting i’s and crossing t’s, of smoothing the way for the shiny new book to burst out into the world. The day I arrived home to find the printer’s first proof copy sitting on my doorstep. When I read the first review and realized that someone other than me and the people who care about me loved my book. So, in all the swirling madness, it’s these moments that I’m trying to remember and savor. If you’d like to pre-order the book, grab it by April 3rd for a special bonus gift. All that information is here. Here’s the wonderful first review I received from The Reading Wolf. Here’s my video of the unboxing of the proof. It wasn’t until I hurried into the card shop to buy a birthday card for my brother that I realized I was going to be solo for Valentine’s Day this year. Mr. Fab had made travel plans and when he’d asked if we had any conflicts on the calendar for those days, I’d said no. The thing is, we really don’t make a big fuss out of Valentine’s Day. We don’t join the throngs of couples in local restaurants and we often poo-poo the whole thing as over-commercialized nonsense. But now that we couldn’t celebrate together, the occasion suddenly seemed more important and I was disappointed we’d be spending the day alone. I’ve always had an odd relationship with Valentine’s Day. As a girl, I loved it. The British custom of giving cards was a little different to the U.S. custom of handing cards to everyone you care about—friends, siblings, parents, and teachers. Growing up, Valentine’s cards were sent anonymously, an annual chance for secret admirers to overcome awkwardness and tell someone they fancied them. The fun came in using detective skills, analyzing postmarks and handwriting to guess the identity of the sender, both of which the truly bashful worked hard to disguise. There was a fly in my romantic ointment. My dad hated Valentine’s Day. His father had died on February 14th several years before I was born, and my dad didn’t even like to hear word of any joy on that day. I was sad about my granddad’s death, but I’d never even met him and it didn’t seem fair that my happiness should have to suffer. I also suspected that my dad might be using it as an excuse to express his displeasure at his young daughter being courted by boys. So, on Valentine’s morning, I’d listen for the postman and sneak downstairs to rescue my cards before my dad could rain on my parade. Only years later did I come to understand how hard that day must have been for my dad. 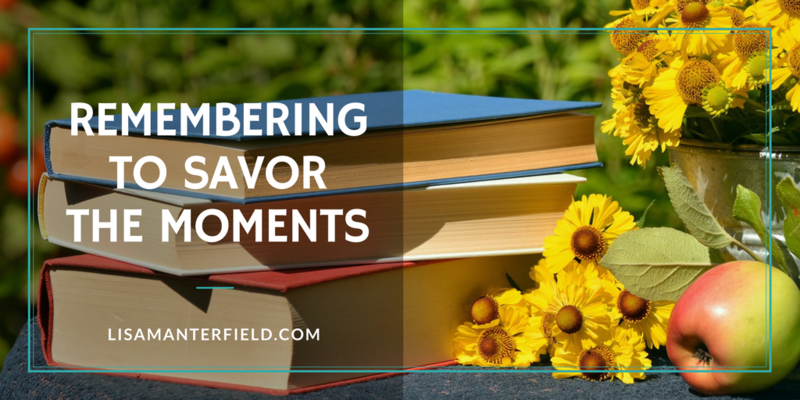 No matter how much time passes and how well we do with moving past our grief, anniversaries can remain painful for a long time, even more so when they fall on days when others are celebrating. Had I been older or had the benefit of hindsight, I might have reached out for my dad, instead of being annoyed at his grumpiness. I might have suggested we go the cemetery on Valentine’s Day and taken my granddad a red rose. 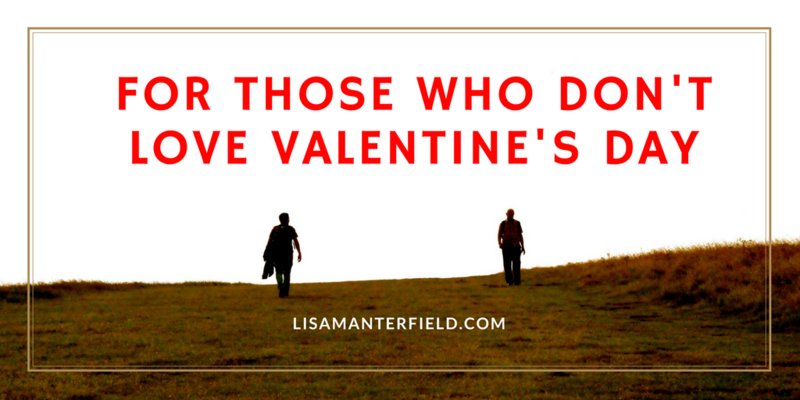 It’s too late for that now, but the experience has made me aware that, for people grieving lost loved ones, or those spending the day alone, it might not always be a happy Valentine’s Day. My dad passed away more than 30 years ago and there was a time I thought I would never get over losing him. It seemed as if everything I did and everything that happened to me was filtered through that loss. I felt, at 15, that people looked at me differently and that it was obvious to everyone that I was different. For a long time, I couldn’t talk about what had happened without my voice catching in my throat and my face burning. In fact, I think it was close to a decade before I could talk about my dad at all without having to forcibly keep my emotions under control. Even now, after all this time has passed, I often find that my grief for other losses is amplified. On several occasions, I’ve been to funerals for distant relatives or acquaintances, people whose passing shouldn’t leave a significant hole in my life, and found myself disproportionately upset. 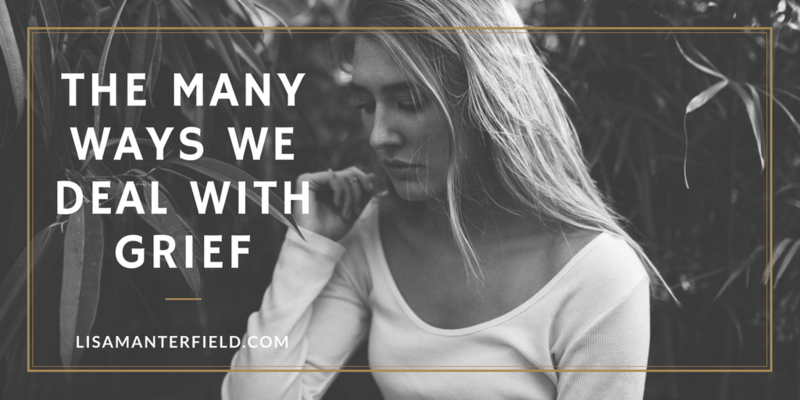 I’m a firm believer that no experience is ever wasted, so I’ve lent some of my experiences with grief to my fictional characters. Although Kat’s story in A Strange Companion is very different to mine, I have borrowed a lot from my own emotional journey for her. I’ve also written parts of my story as essays or melded them into short stories. I recently published a story about my dad that I first wrote for the spoken word event, Spark Off Rose. You can read Lost and Found on Wattpad. I hope to share more of these stories with you soon. Stay tuned! I have a new short story out on Wattpad this week. Lost and Found is a true story about loss, finding strength, and the importance of telling the people you care about that you love them. I hope you’ll give it a read. 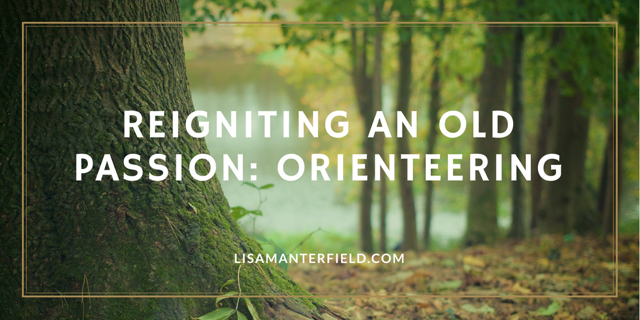 In the story, I write about one of my old passions: orienteering. It’s a sport I discovered by chance as a teenager and rekindled my love for more recently. 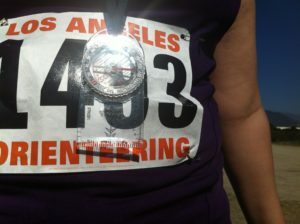 Orienteering is a sport of navigation and speed. In traditional events, competitors must visit a series of checkpoints, in order, in the fastest time possible. There are also score events, with a scattering of checkpoints, each with a points value based on difficulty, and a goal of gathering as many points as possible within a set period of time. What I love about orienteering is that you don’t have to be a mega athlete to compete. This works very well for me! As I wrote in Lost and Found, you can be in the greatest physical shape, but it doesn’t do you a bit of good if you’re running in the wrong direction. Navigational skill and accuracy, plus the ability to read the terrain and make a decision about the most efficient route, is often more valuable than speedy legs. The top orienteers, of course, have both. But at most local events you’ll find people of all athletic abilities and ages, competing individually, in pairs, or in teams. And while you’ll always find serious contenders, most people are out there for fun. I’ve always been a runner, albeit a slow one, but orienteering adds an additional dimension to traveling by foot. I love the opportunity to get outdoors and attend events in new parts of my local area. I love the challenge of navigating my own route and choosing whether to follow the trail or take a more direct route over rougher terrain. Scrambling down an embankment or clambering over an unexpected fallen tree trunk makes me feel tough. Sprinting over the finish line covered in dirt and a few bramble scratches makes me feel alive. Misjudging a route and getting lost makes me humble, and finding my way to the next checkpoint anyway makes me feel resilient. Last year, I won my age group in a local Valentine’s Day score event. Okay, so maybe there were only two of us in my category and maybe my performance wasn’t much to write home about in the grand scheme of things, but I took home a prize—a box of chocolates—which made me feel extremely proud of my non-athletic middle-aged self. 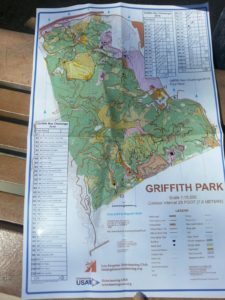 If you fancy a go at orienteering, Orienteering USA has lots of great information, including a directory of local clubs and tips on getting started. 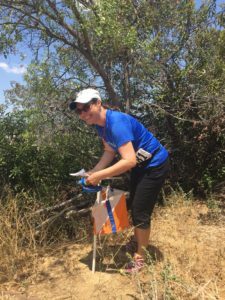 If you happen to be in the Los Angeles area, Los Angeles Orienteering Club is a wonderful, friendly group with events around the county. You can usual rent a compass and e-stick (for checking in at the controls) at events, and find someone to do a quick explanation of how to find your way around. And if traveling by foot isn’t your thing, you could try a mountain bike or cross-country ski orienteering event. I’m thinking of making a ski event one of my goals for this year. It’s a pretty ambitious goal, as I’ve only ever been on a pair of cross-country skis once, and it didn’t end well, but I can see how I could really fall in love with it. Let me know if you try orienteering and how you liked it. 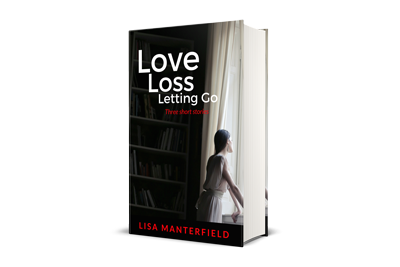 I never intended to write a book about grief. 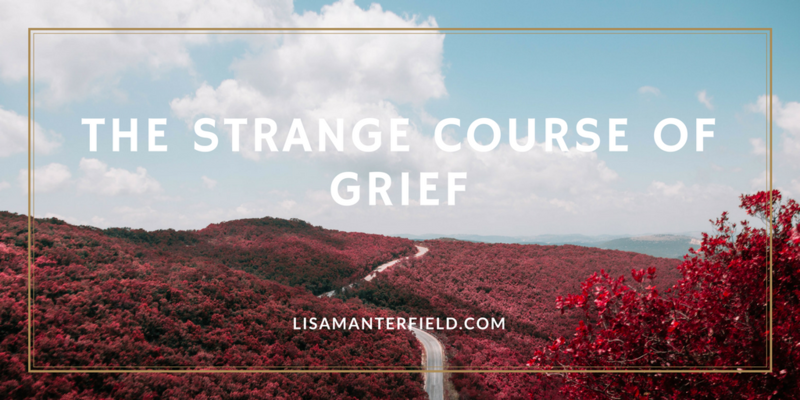 A Strange Companion was supposed to be a story about soulmates and eternal love, but as I dug deeper into the writing, it soon became apparent that, at its heart, this was a story about grief. Grief is a funny thing. It affects people in so many different ways. Some people seem to shut down and forge on as if everything is fine, only to have a meltdown months later. Others are so overcome they can barely get out of bed. Some are pragmatic about death as a fact of life and some struggle for years to make sense of it all. In this story, Kat is struggling to deal with losing Gabe and, even though she knows she has to move on with her life, the memories of him keep pulling her backward. Because of the way she’s learned to deal with grief (i.e. to stuff it in a box and sit on the lid, as we’ll learn later) she’s never been able to fully let go and get over Gabe’s death. She wants to have a relationship with Owen, but she’s stuck in her guilt about Gabe and her inability to let him go. She believes that if she falls in love with Owen, it means she never really loved Gabe in the first place, and so she’s trapped between her desire for Owen and her guilt about Gabe’s death. I’ll admit that I was raised among the “grin-and-bear-it” crowd and learned that grief was something private that happened behind closed doors. Because I never saw grief in action, it left me woefully unprepared to deal with the loss of my dad as a teenager. Like Kat, I didn’t find a good outlet for my grief and it stuck with me and found ways to creep out for a lot longer than it should. Through other experiences in my life, I’ve learned that you can’t ignore grief and, at some point, you have to face your losses. Ultimately, this will have to be Kat’s journey, too. How have you dealt with loss in your life? How do you wish our culture dealt with grief?